Adding a charity donation will turn your chocolates into the sweetest ever! Your friend, employee or business client will be able to select the cause closest to their heart, for the funds to go towards. Over 1000 charities to choose from. Great messaging and branding with your gifts – login for your special corporate or events account and have a free custom redemption landing page. These purveyors of fine chocolates offer an option for inserting your business cards. 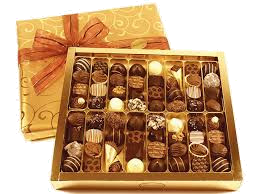 You may find other chocolate, gift basket and general gift item sellers that offer this option as well. If you would like to add a custom card or business card to each of your gifts, we are happy to coordinate. Send your cards to us with your order, or contact us for further information. We will include one card per shipment. Please allow 2 weeks to process these custom orders. Option #1 - Place your order online then add the corresponding number of business cards to your shopping cart from our Business Card Add-On page. Where do I send my business cards? Your custom logo or message will be encased in a gold gift box, along with your real business card. Create a custom mold for your chocolate card or choose one of our stock messages! Packed 50 units per case. Size of each chocolate card: 4" x 2 1/4" x 1/4". 50 unit minimum, $100 one time set-up to create custom mold, 3 week lead time. -Contact us for further information regarding adding custom cards or business cards to your order. -We will include one card per shipment. -Please allow 14 business days to process all custom orders. -24 units for Tasting Party Gift Set. -Please contact our Gifting Specialists for volume discounts on business gifts and large corporate orders. Each package is made with slots on the back so a business card, special note card, or gift card may be inserted. Why send a card when you can send a chocolate card?